Jenny dies on a near-weekly basis. Not in reality, but in my head. She’ll take the kids to her mom’s house–car crash. She’ll be later than expected after going to the grocery store–kidnapping. She’ll go for a workout–random dumbbell mishap. Whatever the scenario, I often fear Jenny is dead. I can imagine the accident, picture the police heading my way, and wait for the phone to ring or for there to be a knock on my door. Thirty people were circled on our back patio talking about life. Someone mentioned a scenario where their spouse was late coming home and they assumed he was dead. “You do that too?” I said. 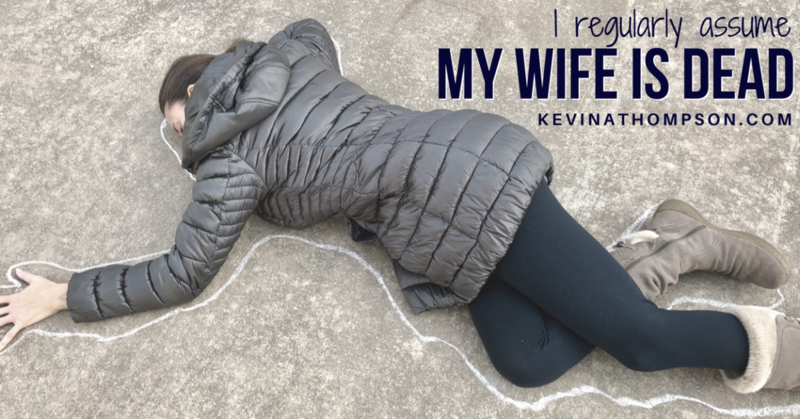 We talked for a minute about the variety of ways our spouses had died over the years. Jenny was shocked at the thought. She had never considered my possible demise. It seemed demented. I asked how many in the group occasionally or regularly fear their spouse is dead and nearly every couple had one spouse raise their hand. It’s a sick game, but it’s fully understandable. Some worry about the possible death of their spouse because we have deceived ourselves into thinking that if we prepare for it, we will handle it better. It’s a matter of control. We believe that what we control will not cause us pain. Of course, life is full of a thousand pieces of evidence to the contrary, but we keep returning to worry in hopes of managing our way around our next sorrow. We try to control life so we think we can control grief, heartache and disappointment. Worry is a denial of our humanity. While everyone worries to an extent, when it becomes excessive, we are overestimating our power and ability. We are foolishly attempting to control the future even when we are aware that much of the future is outside of our control. Worry is an attempt to play God and therefore prevent bad things from happening. Or play the role of a machine by properly processing every fathomable outcome so that if one is to occur we will have already emotionally dealt with that scenario. Neither is possible. The antidote to worry is a deep recognition and appreciation of our humanity. Emotions can be influenced but they cannot be denied. Future events can be considered but they can’t be fully controlled. Every worry should be an invitation to be reminded of who we are, our limitations, our opportunities, and a redirection toward what actions and attitudes deserve our energies. Worry is a mirage. It gives the appearance of work, but it lacks any substantive value which true work brings. Work changes things. When we put our energies and effort toward actions which influence outcomes, that is work. Worry changes nothing. It demands the same amount of resources–if not more–but it has no positive impact on potential outcomes. At the heart of worry is this belief that as long as we control things, life won’t hurt. Ironically, the more we attempt to control those things which we can’t control, the more life hurts. Yet like an addict, we continue to seek refuge in the very source of our problem. When our controlling nature contributes to our pain, we seek to control even more. Instead, we should embrace our humanity. We have limitations. We can’t do it all. No matter how much we care or try, some things are beyond our ability. Other people deserve the right to make their own decisions. Many things are outside of our control. We have imperfections. Even if we were able to control all things, we would mess up many of those things. In part, worrying is an overestimation not only of how much we can control but also how well we are at controlling things. We have sorrows. While some hurts in life can be avoided, grief itself is a part of life. We must embrace the reality that life is going to hurt. We don’t have to seek out pain, but we can lean into unavoidable pain knowing that it is a key element of life. Trying to spend every second to avoid or prepare for sorrow doesn’t lessen our hurt; it compounds it. I doubt I can fully overcome the occasional thought that the worst might have happened. But when those thoughts arise in my head, I can use them as a reminder that I’m attempting to be something other than human. These thoughts can be an opportunity to accept the many things I can’t control in order to focus on the few things I can. But I really did almost loose my husband in a car accident-a stormed knocked a big tree down right next to him as he sat in the car on a random driveway waiting for the storm to pass. And as we live in Michigan, well, poor road conditions are a daily reality-either because of ice/snow, or potholes. I have also had the worry of losing my husband or one of my children. Good read. Five minutes late and my mind goes there. And I’m an optimist by nature. its not control, it’s giving up. Without Faith one is left to attempt to over power reality or giving up. This is giving up. Matthew 8:23-27 Mark 4:35-41 Luke 8:22-25, One day Jesus said to his disciples, “Let us go over to the other side of the lake.” So they got into a boat and set out. 23 As they sailed, he fell asleep. A squall came down on the lake, so that the boat was being swamped, and they were in great danger. 24 The disciples went and woke him, saying, “Master, Master, we’re going to drown!” He got up and rebuked the wind and the raging waters; the storm subsided, and all was calm. 25 “Where is your faith?” he asked his disciples.